At the end of November 2015 The Larder Food Bank in St Christopher’s, Mersey Street, just beside the Oval in East Belfast, gave out emergency food to it’s 5000th person in under three years. It is a ministry of a Church of Ireland Church Plant in the now redundant St Christopher’s Church and is led by Revd Adrian McCartney. Adrian joined us at our Epiphany Service in early January and spoke of his work. He said: “The Larder in St Christopher’s exists to both serve people in need and as a reminder that some things in our society are not working as well as they could. At the original feeding of the 5000 Jesus said to his followers, ‘You give them something to eat.’ We would like to apologise to all those who have less than they need because we want to keep more than we need”. It was a very challenging address and highlighted the great need that exists in so many families today. At that service, members of the congregation brought along food items as an Epiphany gift for The Larder. Adrian left Donaghadee with his car loaded with groceries and a commitment that we would pray for and support this new ministry in East Belfast. A box will be permanently kept in church for grocery or other items like washing up liquid, jay cloths, toiletries – but Adrian amusingly said no soup or beans! They get a good amount already! I visited Adrian at The larder to see his work and was humbled to see the groceries we gave in Donaghadee being bagged for families in East Belfast. 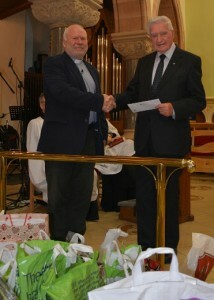 Thank you to our congregation for their generosity. Though a food bank doesn’t exist in Donaghadee we have access to food banks in Ards and Bangor; if anyone ever hears of someone in need please speak to me and I can assist them with accessing local food banks. Locally, donations can be left at Shore St Presbyterian Church and St. Comgall’s Roman Catholic Church, Millisle Road. So no matter where you make your donation, please give! As you will see from the inserted photo we also presented a cheque to The Larder as part of our annual missionary support. Thank you to Billy Murdie for making the presentation. Billy in his years with the Housing Executive worked bringing assistance to the poorest of areas of Belfast and it was fitting that he presented the cheque on behalf of the Select Vestry and congregation. We have nearly concluded our year of Mission in Donaghadee, with services in which God has blessed us and spoken to people’s needs in a very real way. We have also enjoyed some great events. I hope that this Year of Mission, if it has done anything, is that it reminds us to always be an outward facing congregation. It would be easy in Donaghadee Parish, with such a comfortable and beautiful church building and a warm church fellowship, to become some sort of cosy club! Jesus said build my church and go and make disciples! As your rector I pray that I may have grace and strength to continue to do this into 2016 and to see the Lord continue to add to our number those who quietly come to faith! The seekers! And even the odd doubter! When I meet people around Donaghadee who don’t come to church: I ask why? I’m amazed at their answers. Are they rejecting the institution of “The Church” or simply God! As we leave Christmas the message of Jesus’ birth still rings true: For heshall save his people form their sins! That’s what I need for living! What about you?